NAIROBI, Kenya — Countries in sub-Saharan Africa face myriad obstacles in ensuring their populations receive requisite vaccinations to combat diseases. Participants at the UNICEF-organised News Cafe, at a Nairobi hotel. Kibet Sergon, an official of the World Health Organization (WHO), says challenges include difficulties in delivering the vaccines to targeted populations due to logistical problems and scarcity of trained medical personnel. Sergon, an expert in public health, adds that inadequate equipment and lack of electricity for preserving vaccines given that most require refrigeration, poor level of awareness among the population on benefit and value of immunisation are other limitations hindering success of immunisation campaigns. The expert, who works with WHO‘s department of Immunization and Vaccine preventable Diseases Programme, was speaking during a United Nations Children’s Fund (UNICEF) “News Café” event that took place in Nairobi on 16 October. 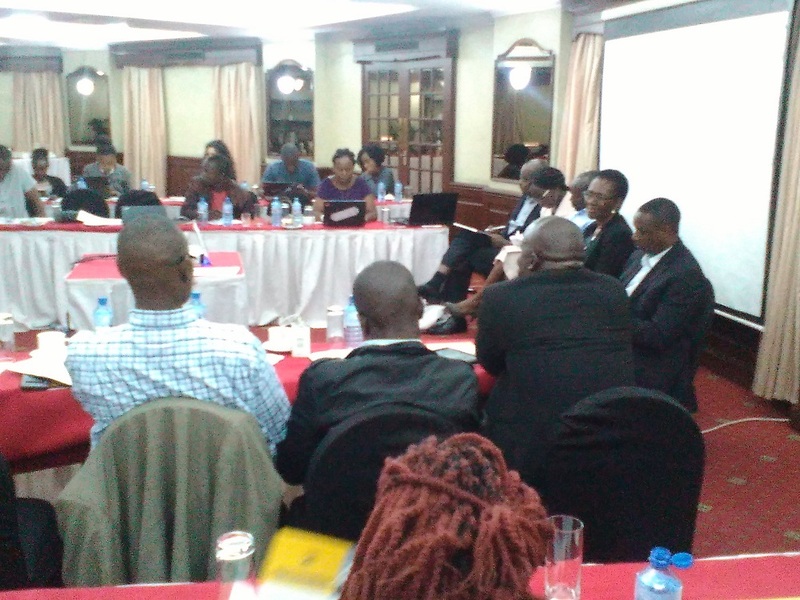 The event was attended by journalists, officials of Kenya’s Ministry of Health and representatives of the WHO. According to Sergon, in the last 10 years, the WHO has been working with organisations such as UNICEF to ensure vaccines are available in the developing world. “We strive to ensure that vaccines that are available in the developed world can also be accessed in the developing nations, so that children get them at the right time,” Sergon said. The WHO’s goal is to ensure universal immunisation for all children below six years. Interestingly, noted Sergon, the more diseases are eradicated through immunisation, the more people become complacent in terms of tackling vaccine preventable diseases. “Observably, success in diseases eradication through vaccination is leading to reduction in outbreaks, but a new challenge is emerging, people assuming that disease outbreaks won’t occur and ignore seeking vaccinations,” he said. According to Sergon, there is need for governments in Africa to undertake universal vaccination campaigns. He reiterated that vaccines are safe and have 85 – 100 percent efficacy, with few side effects such as fever and swelling. He added that immunising children against diseases relieves households of the burden occasioned by frequent illness. Sergon said vaccines should be administered to children in Africa as a right. He is optimistic that the continent is witnessing progress in immunisation coverage despite many barriers. He cited the example of Kenya, which he said has gone beyond the provision of traditional vaccines that are recommended during childhood http://motherhood101.co.ke/archives/9764 and introduced others for diseases like pneumonia, meningitis, diarrhoea, rubella and polio injectable vaccines. Indeed, immunisation is a basic right in Kenya. In recent years, the government has been carrying out large-scale polio vaccination campaigns. Kenya’s Ministry of Health routinely undertakes immunisation campaigns. In fact, the country is scheduled to conduct a polio vaccination campaign from 20-24 October, targeting 2.8 million children aged 0-59 months. During the meeting, whose topic of discussion was ‘Immunization: Vaccines Work’, Peter Okoth, UNICEF health specialist, said although polio is a crippling and potentially fatal and infectious disease, there are safe and effective vaccines to tackle it. According to Okoth, much ground has been covered by concerted global efforts. “Massive decline in polio paralysis has occurred since 1988 when aspiration for eradication was declared from 350,000 cases to just 80 cases of all forms of polio in 2018 in Afghanistan, Pakistan, Nigeria, Papua New Guinea, Niger, Nigeria and Somalia,” he stated. Okoth said the health ministry is working with partners to mobilise communities through volunteers, health workers and local leaders in executing vaccination programmes. The UNICEF health specialist said the campaign has been necessitated by continued polio outbreaks in neighbouring war torn Somalia and the rest of the horn of Africa, which has a high burden of diseases that can be prevented by vaccinations. http://www.health.go.ke/?p=4729 “Kenya is still at risk of importation of the polio virus from neighbouring countries,” he said. He added that the campaigns are a rapid intervention to improve population immunity, especially in areas with low routine immunization coverage.“The campaign is meant to protect children in 12 high-risk counties with low vaccination, weak surveillance, coverage and high population movement,” he said. Okoth noted that in general the country has witnessed a decline in polio cases due to routine vaccination, aggressive campaigns and surveillance for children with sudden paralysis. He revealed, however, that several outbreaks have occurred in Kenya since 2006 mainly due to importation, with the last being witnessed in 2013 but was managed controlled through multiple rounds of vaccination campaigns,’’ he stated. According to the Ministry of Health, vaccines are provided free through routine immunisation in health facilities. Aggressive campaigns are undertaken to sensitize the public. But there have been mixed results. The Ministry of Health indicates that some 1.7 million children born between 2013 and 2017 did not receive all the scheduled vaccines. Okoth explained that the situation translates into one out of three children being at a risk of contracting vaccine preventable diseases. He added that globally, the lives of two million children can be saved if they access vaccination and the right information. “Children from poor households and those living far away from health centres top the number of those who fail to be vaccinated,” he noted. Rose Edder Jalang’o from Kenya’s Ministry of Health, an expert in public health, said Kenya’s programme on immunisation has evolved from an initial focus on a few vaccines to several in order to reduce severity of diseases. The latest vaccine to be introduced is the cervical cancer vaccine. “In Kenya’s estimated population of 48 million, the target population is 1.5 million children. Vaccinations are offered in around 7,000 health facilities across the country,” she explained. Kenya is yet to achieve 90 percent vaccine coverage, she said. “We’ve not done well. Children who have not been vaccinated don’t have tags. If a country has children who have not been vaccinated it risks experiencing outbreaks,” Rose said. Kenya’s Ministry of Health spends some USD 14 million per year to procure vaccines https://www.unicef.org/kenya/media_21508.html through a programme co-funded by GAVI, the Global Alliance for Vaccines and Immunizations (GAVI). The cost is expected to increase to USD 50 million by 2026 when GAVI funding ends. She said the country is transiting from low income to a middle income country, and donor funding for immunisation programmes will thus reduce. Her fears are that if GAVI scales down funding, the government may struggle to procure vaccines with communities like pastoralists who move from place to place with their livestock and already face low levesl of vaccination coverage likely to be affected most. But there is some reprieve. “Good news is that GAVI’s withdrawal is going to be done in phases such that during the initial stages the stages, GAVI will monitor to ensure that in case of outbreaks, support for provision of vaccines will be accorded. Samson Thuo also from the Kenyan Ministry of Health said national coverage for immunisation that was above 70 percent dipped to 63 percent in 2013 despite a target of 90 percent but has currently risen to the rate of 74 percent. “Frequent health worker strikes, decline in vaccine stocks, and inadequate engagement with communities such as religious leaders who oppose vaccination campaigns,” she cited as reasons for the fluctuation. Rose castigated views held by some groups in Kenya that vaccines could be harmful to the health of children, saying they are not only safe but affordable and yield good results. “The public should embrace them. Just because one is not seeing the disease the children are being vaccinated against, it does not mean the disease doesn’t exist,” she said. Participants in the meeting noted that myths surrounding vaccines should be debunked by the media through mobilising the public to cooperate with health authorities during immunisation campaigns.